Shanghai Disney Resort, the first Disney resort in mainland China and the sixth worldwide, celebrated its historic grand opening earlier this month, the culmination of one of Disney’s most ambitious projects ever. The wonder and imagination of Disney greeted the people of China in magical new ways as the gates opened to Shanghai Disneyland, a theme park like no other with the biggest, tallest castle in any Disney park, the first pirate-themed land and Disney’s most technologically advanced park to date. Bob Iger, chairman and chief executive officer, The Walt Disney Company, celebrated the opening of the vacation destination with thousands of distinguished guests, celebrities and Chinese officials. Shanghai Disney Resort reflects Disney’s 60-year history of innovation, creativity and storytelling, in a way that is authentically Disney and distinctly Chinese. “The grand opening of Shanghai Disney Resort is a celebration of creativity and collaboration, a triumph of imagination and innovation, and a testament to the strong partnership between Disney and China,” said Iger. “Together we have created an extraordinary destination, a magical place unique in all the world, where East meets West, the past meets the future, and anything is possible for those who believe. 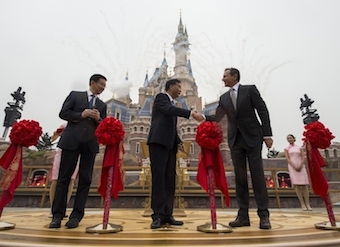 Honoring the Disney-Chinese partnership that created this resort, Iger and Chinese officials cut a red-and-gold ribbon to dedicate Shanghai Disneyland, the resort’s magnificent theme park. Disney developed the Resort in a joint venture with Shendi Group. In a statement, Fan Xiping, Shendi Group chairman, said: “After five years of joint efforts, partners from both China and the United States have created magic together. In the process of combining global standards and local best practices, we integrated with each other and established mutual trust and effective communication. “The young team has learned and grown in the process, bringing into full play its role as the local guide. The team worked closely with Disney in the development and construction of Shanghai Disneyland and the resort, jointly building the tallest and largest Disney castle in the world, and providing quality services to our guests. Shanghai Disney Resort is filled with immersive Disney storytelling, thrilling attractions, spectacular live entertainment and memory-making experiences designed to inspire and delight Chinese guests. The world-class vacation destination includes a magical theme park with six themed lands, two imaginatively designed hotels, a Disneytown shopping and dining district, and Wishing Star Park recreational area. Shanghai Disney Resort offers a range of magical experiences, from thrilling adventures and original entertainment to themed food and beverages, beautifully landscaped gardens and novel places for guests to play, relax and dream.